This image, taken by the LROC instrument aboard NASA's Lunar Reconnaissance Orbiter on July 28, 2013, shows the 62-foot-wide (18.8 meters) moon crater (center) produced by an impact on March 17, 2013. 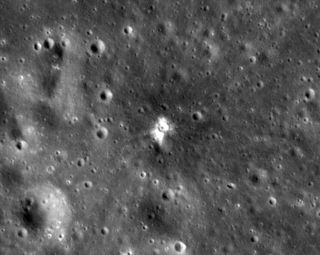 A moon-orbiting NASA spacecraft has spotted the crater produced by one of the most powerful explosions ever observed on the lunar surface. The blast occurred on March 17, 2013, when a boulder-size space rock slammed into the moon, generating a flash of light 10 times brighter than any explosion recorded to that point on Earth's nearest neighbor. Researchers at NASA's Marshall Space Flight Center in Huntsville, Alabama, caught the flash on camera at the time. They asked the team working with the Lunar Reconnaissance Orbiter Camera (LROC) instrument, which flies aboard NASA's Lunar Reconnaissance Orbiter probe (LRO), to hunt down the new hole in the ground. "They predicted how big [the crater] was going to be based on the energy, but this was all a model," LROC principal investigator Mark Robinson, of Arizona State University, said in the NASA video about the newfound moon crater. "So it was a great opportunity to actually calibrate their model." LROC scientists have developed an algorithm to search for craters automatically in "before-and-after pairs" of photos taken by the instrument. They applied the algorithm to images gathered by LROC on May 21, 2013, and July 1, 2013. No crater was found, but the researchers did find odd splotches and linear features near the presumed impact site. Finally, the crater appeared in photos taken of a slightly different swath of lunar real estate on July 28, 2013. LROC's observations revealed that the newly created hole is 62 feet (18.8 meters) wide, NASA officials said. But the impact's effects are visible across a much larger area. "You could see that the splotches are actually lined up. These very small clods of ejecta were thrown out 10, 20, 30 kilometers away," Robinson said. "That's 30,000 meters compared to an 18-meter-diameter crater. So it's a very exciting discovery." The new results were reported in the Jan. 31 issue of the journal Icarus. The $504 million LRO mission has been studying the lunar surface since 2009. LRO first worked as a scout, sussing out the lunar surface to help NASA plan for future robotic and human missions. But the probe switched over to more of a pure science mode in September 2010.